For centuries, people who've lost all their teeth have worn dentures. 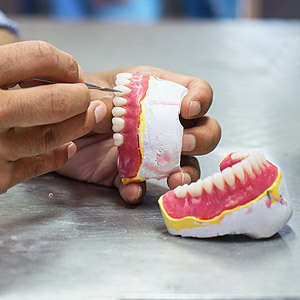 Although materials in today's dentures are more durable and attractive than those in past generations, the basic design remains the same — prosthetic (false) teeth set in a plastic or resin base made to resemble gum tissue. If you're thinking of obtaining dentures, don't let their simplicity deceive you:Â a successful outcome depends on a high degree of planning and attention to detail customized to your mouth. Our first step is to determine the best positioning for the prosthetic teeth. It's not an “eyeball” guess — we make a number of calculations based on the shape and size of your jaws and facial features to determine the best settings within the resin base. These calculations help us answer a few important questions for determining design: how large should the teeth be? How far forward or back from the lip? How much space between the upper and lower teeth when the jaws are at rest? We also can't forget about the artificial gums created by the base. How much your gums show when you smile depends a lot on how much your upper lip rises. We must adjust the base size to accommodate your upper lip rise so that the most attractive amount of gum shows when you smile. We also want to match as close as possible the color and texture of your natural gum tissues. There's one other important aspect to manage: how your upper and lower dentures function together when you eat or speak. This means we must also factor your bite into the overall denture design. This may even continue after your dentures arrive: we may still need to adjust them while in your mouth to improve function and comfort. Ill-fitting, dysfunctional and unattractive dentures can be distressing and embarrassing. But with careful planning and customization, we can help ensure your new dentures are attractive and comfortable to wear now and for years to come. What is a Laser Filling? How to Care For Your Veneers? What is Root Debridement Therapy?